The Energy ETF XLE reversed course over the last three days, stalled at $78. Energy Service XES is turning down at $19. Momentum is also rolling over. Now that was helpful information to readers as that is exactly what happened. The stock market retreated from its near vertical parabolic rise. The DJIA is down another 200 points as I write this Friday Morning. Last week we suggested that Cliff Natural Resources was a potential ‘canary in the cola mine’ for what was liable to happen in the markets. Prior to the invention of electronic devices to measure air quality, coal miners would literally have a live caged canary in the mine. If the canary looked il or died it was a warning to exit the mine. The warning is worth repeating. The stock price had rallied form $5.75 to $8.75. The price jumped to $9.15 on the news. Then price immediately reversed closing at $7.89, just over the low at $7.60. Technicians refer to this as an outside reversal day. My target became $7 for CLF. Sure enough this morning it is trading at $6.80. I still believe we will see a substantial commodity price rally over the next couple of years. What we are witnessing with the price decline of iron ore producer CLF is a shake out to scare off the weaker players before the action really gets under way. The West Texas oil price is firm this morning at $65.59, thank you weak U S Dollar. We also warned last week that the at odds comments by the Treasury Secretary and the President at Davos were unsettling the markets. Such odds are inexcusable from leaders in those positions. I am encouraged that Trump did not mention NAFTA in his State of the Union. And just this morning we have some positive reports on the NAFTA negotiations. Our predictions are correctly playing out in share process. The energy ETF XLE ran form $61 to $78 in five months time. This morning it is breaking its 34 day exponential moving average (I know that sounds really techie, eh?) to the downside. A $68-70 target seems reasonable. Energy Service XES is breaking down in similar fashion. In the same time frame it ran from just under $13 to $19. Sixteen dollars seems reasonable for XES. Meanwhile the US continues on its track to energy independence. As the Wall Street Journal notes this morning, President Obama called Sarah Palin’s motto of Drill Baby Drill a bumper sticker as recently as 2012. Who’s laughing now? In 2006 the IUS imported 12.9 million barrels a day mbd. Last fall we imported only 2.5 mbd. And last fall the US exported 1.5 mbd. We have noted this has kicked off billions of dollars in port construction in Corpus Christi. Natural gas production increased 50% between 2010 and 2017. Natural gas futures have fallen from $3.50 to $2.86 in the last eight days. The oil industry has quickly adjusted to the price drop and is now profitable with the mid-sixties pricing. We have consistently warned that the Dow Industrials DJIA were some 4,000 points above its widely watched 200 day moving average. Even with a 250 point sell-off this morning the DJIA is 3,500 points over its 200 day MA. The market has needed a correction. Whether is was a top or the top remains to be seen. For now the litany of good news cited in the State of the Union, low unemployment, paycheck bonuses, new plants being built, should support a correction and then rally into the usual seasonal high in May. Here is a look at the quite unusual VW factory in Dresden Germany. It produces the Phaeton. This was supposed to be the up market VW,but the public was not willing to pay audi prices for a VW badged product. Phaeton only sold 25,000 cars world wide in four years. Amazon is filing Drone Patents faster than you think. Automated fly by air delivery may be closer than we think. Here is another example of how a machine replaces a human to do repetitive tasks. MCD seems to be losing out in the burger wars. And it is happening at both ends. On the low end, In and Out Burgers features a simple menu and has two SA locations. It reminds me of the original MCD. Five Guys has five SA Locaitons now. And then there is Chester's and Whataburger and Burger King and Wendy's. And who can forget Big'z Burger Joint. OH wait what about \Sam's Burger Joint! My take is that MCD is just like Wal Mart WMT. Both have preached low price for so long they own it. Attempts to go up scale have never worked. MCD is never going to build a Five Guys in side a Golden Arches. So give it a rest guys. You have too many locations, a mistake Whataburger has not made. After a big start in offering server based e mail, the firm has seen its stock price slide and profits fall. Speculation is that a large fim like MSFT might be a buyer to get in on more cloud based services. Stay tuned. Michael Pearson Valeant CEO got a $100 M margin call from Goldman Sachs this past week. Friday Oct 30 GS told him to pay the loan or face foreclosure by Tuesday Nov 3. Sure enough GS sold 1.3M shares that Thursday Nov 5. We study equity in ACCT 3302 and 3304. So here is a teachable moment. What is a margin call? Stock purchased with borrowed money from the border is said to be bought on margin, that being the borrowed money. Ione can borrow 50% of the purchase price. If however the stock falls enough that the 50% equity of the buyer is wiped out, the broker 'calls' the margin and sells the stock. VRX.TO has been in free fall.That is the reason for the margin call. It is falling so much there is barely equity to pay the loan. On this two hour chart one can readily see the GS forced sale Nov 5. And it looks like there have been at least two other previous instances where no doubt the same thing happened. Dumping such a stock into a market with few buyers, well I am amazed the stock has not gapped down much further. Luis had the chair of Merrill Lynch, the strategist for Goldman, and John Templeton. The CEO of Merrill is virtually useless, clearly understands little about markets or market history. The guy from Goldman also speaks glibly but seems to have some understanding. Templeton stands head ands holders above the other two,observing that the bear market might already be over. Which is was. He is most interesting in Part II observing that there are always bull and bear markets but that as long as you do not buy with borrowed money and invest well, you will be all right. Now reading assignment who is or rather was John Templeton? Here is a collection of comments from former FED Chair Bernanke who never saw the bad news coming. Janet will likely do the same. Companies Buy Their Own Stock, No Wonder the Market is Up! We study earnings management and financial engineering in both intermediate accounting and ethics. Here is an example of a potential research article for the ethics class. How much have stock buy backs figured in moving the stock market higher? Do companies have to generate real earnings are can we just buy plow our own earnings into stock. lowering hte numnber of outstanding shares and raising earnings per share? Editor's note: With permission, this article was adapted from the January 2015 issue of The Elliott Wave Financial Forecast. For one week only, EWI is throwing open the doors to its big-picture U.S. outlook. Follow this link to read a lot more of their latest analysis, 100% free, by joining the State of the U.S. Markets Conference. NYSE margin debt was $457 billion in November, still down from its February 2014 peak of $465.7 billion. 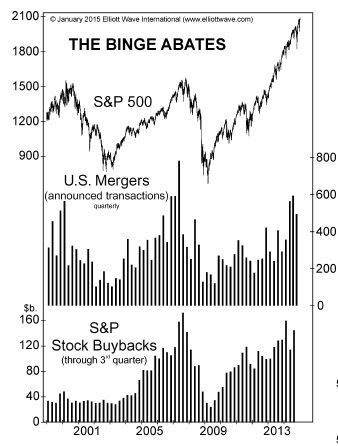 This updated chart of corporate buybacks and mergers shows that after reaching the highest levels since the S&P's 2007 top, buyers pulled in their horns somewhat as 2014 drew to a close. Thus, two more key measures of optimism suddenly betray a diminishing appetite for stocks. As we noted in The Elliott Wave Financial Forecast in November, the investment community's obsession with share buybacks at price peaks generally turns into a deep misgiving. This process appears to be underway, as Bloomberg recently quoted a chief investment officer saying, "You can only go so far with financial engineering before you actually have to have a business with real growth." The financial media sometimes refers to this corporate largesse as "money returned to owners." But history shows that it's nothing of the kind, because shareholders invariably hold on to their investment until stocks prices are much lower. By then, buybacks are so completely discredited that they all but cease to occur. A reversal must be close: Bloomberg recently reported that in 2014, S&P firms will spend about 95% of their earnings on their own shares and dividends. Some companies are even borrowing money to buy their own shares. It's a strategy they will come to regret. I made the comment on the investment blog that the smart money would 'bet on Vlad.' So far that prediction is working pretty well. Here is a good summary on red flags the West ignored. AFter drawing a red line in Syria and then failing to follow through, Putin seized the initiative so keep his man Assad in Office, and his Navy Base in the med. In 2011 Ralph Peters correctly identified Putin as the most dangerous man in the world. As Peters describes it, Putin wants a Russian commodity economy. He can and does control that. He could not control an economy that was consumer oriented. And so six to seven decades after the end of WW II, Russia does not produce a single consumer product other than vodka and AK 47s. Dictators and tyrants will always expand into weakness. Putin ahs been trying out the U S Syria and found nothing to stop him. And so he invades the Ukraine. teh Berlin Airlift. I don't see anything like that as possible now. Berlin was a small city, the Ukraine if an entire country.